Combining nostalgia and modernity, with brilliant design and world-class fabrics, Pappe is a high end, luxury Australian baby and toddler fashion brand founded by entrepreneur Karena Simpson. After becoming a mother herself, Karena was surprised to see a gap in the Australian market for stylish, high quality baby and children's wear, and found the clothes available were unable to meet her expectations for design and sophistication. Inspired by the contrast between traditional children's wear and contemporary trends, Pappe combines beautiful design with world-class fabrics. Each collection embodies Pappe's signature timeless, minimalistic aesthetic with every aspect of Pappe's designs considered and attention to detail always at the forefront. For Karena, utilising luxurious fabrics whilst still ensuring practicality was intrinsic to the Pappe brand. "We've travelled all over the world, France, Italy, Scotland, Japan and London, to ensure the fabrics we use are handpicked for their premium softness and longevity. We use only the finest Scottish spun cashmere, organic cottons and pure wool blends. However, being a mum, I understand the need for practicality, we are, after all, a children's brand! Our pieces are neither heavily adorned or labelled, but instead we focus completely on design, craftsmanship and refinement. The Pappe collection includes both clothes and accessories, all designed in a palette of neutral colours, classic tartans, chambray and navy. 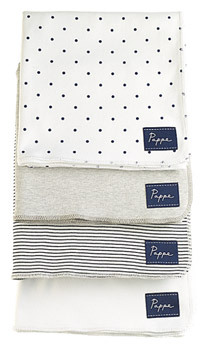 Pappe's range of organic wraps (RRP: $29.95) are ideal for the cooler months, featuring 100% organic cotton knitted into an interlock fabric to ensure your little one is always kept warm and safe. Both durable and soft, the organic blankets are an every day essential for mums, and are available in a range of patterns and shades that epitomise the signature Pappe minimalistic and sophisticated style. The Ardallie Cashmere Cardigan (RRP: $129.95) is a timeless and classic piece. Made from 100% cashmere, these gorgeous cardigans feature a ribbed waistline and cuffs, and are adorned with beautifully handcrafted wooden buttons. A standout in the collection this year and a fantastic keepsake for mums with toddlers are the Winsome Lace Ups (RRP: $189.95). Handcrafted in a small town in the heart of Macerata, Italy, these gorgeous shoes are made of premium Italian leather, rounded wax laces and para rubber soles for ultimate comfort and bendability.